Cheese and yogurt waiting to be stirred. Enchiladas are a labor of love, so I keep coming up with lazy methods for getting the same flavors and textures. I’ve already made enchilada casserole – layering the tortillas with the sauce and other ingredients like lasagna instead of individually rolling them – and it makes for great leftovers that last in the freezer and just get better. But even that is a pretty messy endeavor – I still make the enchilada sauce and lovingly layer each ingredient before baking for 30 minutes. Soup, on the other hand, is the laziest possible interpretation of enchiladas. This version is very much inspired by classic tortilla soup, and to me the best part of that is getting soggy bits of corn tortilla that thicken the soup and remind me of the texture of proper enchiladas. 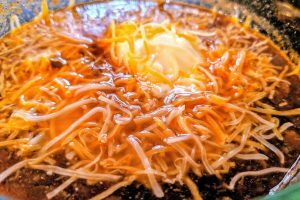 If you leave out the toppings at the end, this is a flavorful and healthy tortilla soup – it’s the creamy cheesy addition that really brings the whole thing together to taste like enchiladas. I add beans and corn to bulk up the soup, even though I would normally leave them out of enchiladas. Instead, I might typically saute various peppers with the onions and garlic, like a variety of bell peppers or some poblanos. My high aspirations for this soup are to make a version that uses the classic ingredients of New Mexico – blue corn and hatch green chilies (although I would probably leave out pine nuts, which I don’t think belong in this texturally). But it’s hard to find good versions of either of these ingredients if you don’t live in the area – I’ve never been particularly happy with canned green chilies, and blue corn flour and tortillas are hard to come by. I might try this with blue corn chips in place of the tortillas, but I would leave out the salt until after they’ve been added. In a large saucepan over medium heat, heat 1 tsp oil and saute 1 chopped medium yellow onion, 3 minced cloves of garlic, and 2 minced jalepenos with the seeds removed (and the rib if you don’t like spicy) with a pinch of salt. When the vegetables are soft and beginning to brown, add 1 ear of corn kernels (or about ¾ cup frozen or 1 can, drained and rinsed) and 1 minced chipotle pepper in adobo sauce with the seeds removed. When the chipotle is incorporated and the corn is slightly browned, add the spices: ½ tsp each cumin, coriander, and paprika. Mix in the spices to make them fragrant, then immediately add 1 15oz can of chopped tomatoes and 4 cups chicken stock. Stir well, scraping the bottom of the pot. Finally, add 1 shredded cooked chicken breast (rotisserie chicken is great for this if you don’t have leftovers and don’t want to put in the extra time to cook the chicken), ½ can each black beans and dark kidney beans, and 1 small corn tortilla cut into small pieces. * Bring the entire mixture to a boil, then reduce to low and simmer for at least 15 minutes, stirring occasionally. Taste for salt. Serve with sour cream** and shredded cheese. *The tortilla acts as a thickener for the soup – it doesn’t completely dissolve, so you will end up with pieces similar to well-cooked noodles, which add a nice texture. You can exchange the tortilla for about 2 tbsp blue corn flour added to the vegetables after they saute and this will thicken the soup more uniformly and add another flavor. **I like to use plain full-fat yogurt instead of sour cream because I tend to have it in my fridge and it tastes exactly the same, although it does not incorporate as well and looks (but does not feel) grainy in the soup. Vegetarian variation: Use vegetable stock instead of chicken stock – pick one that has a tomato base to complement the flavors already in the soup, or one without mushrooms, which could be overpowering here. Use two whole cans of beans total (instead of the two half cans listed) to replace the chicken.